The invention relates to a process for casting novel motor vehicle wheels from metal, such as from an aluminum alloy, which wheels have a rim ring and a hub part connected by supporting radial elements. 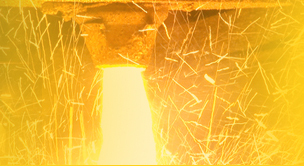 According to the present process the casting mold is formed by a plurality of molded core parts that are mainly ring- and/or disk-shaped and which are axially assembled while still attached to their mold sections and are centered relative to each other by the relative adjustment of the mold sections. The parting plane of the core parts runs perpendicularly to the wheel axis. 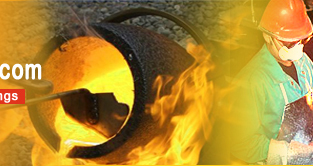 This permits one-piece wheels to be cast with great accuracy, which wheels have few, if any, visible mold seams. Field of the Invention: The present invention relates to a process for casting a motor vehicle wheel from metal, especially from an aluminum alloy, said wheel having a rim ring and a hu b part connected thereto by supporting radial elements. Description of State of the Art: Because of the special shape of the rim well, motor vehicle wheels cast from an aluminum alloy are manufactured in such fashion that a bi- or multipartite radially-openable mold is used for forming the rim well section. However, the precision that can be achieved in this manner as regards true-running, uniform wall thickness, etc., make it necessary for the cast blank to be finished by a costly machining procedure. All additional elements to be mounted, such as fan rings, trim coverings, especially trim coverings for purposes of air guidance for example, have to be manufactured as separate elements and then mounted on the cast wheel body, such as by bolting. Then, after machining and assembly of the additional parts, additional finishing is required to balance the finished motor vehicle wheel.